We already told you last week how Mike Love burst the bubble of any on-going, long-term Beach Boys reunion ... he's been booking dates as The Beach Boys featuring himself and Bruce Johnston and their regular cast of side musicians ... "the same group you've enjoyed for the past 14 years". WHY on earth he would choose THIS route over a continued full blown reunion that includes Brian Wilson, Al Jardine and David Marks (along with loving tributes to the dearly departed Carl and Dennis Wilson) is beyond me ... honestly, it just comes across as pure selfishness. (I mean, come on ... this killer line-up played to sold-out houses around the globe ... and generated a world-wide media blitz of glowing accolades, the likes of which The Beach Boys haven't seen in decades. Their brand new reunion album came in on the charts at #3!!! When is the last time The Beach Boys had a #3 album in America?!?!? Well, actually, I can answer that question ... it was 1974, nearly 40 years ago, and even then it was with a compilation LP called "Endless Summer" ... the last album of all new material to peak at #3 or higher was 1965's "Summer Days (And Summer Nights)", so add another ten years to that tally. They're sure not going to "do it again" with Mike and Bruce at the helm. Yes, they'll still be able to play to packed houses because people love these tunes ... and, if nothing else, a Beach Boys concert has always been a good time ... but how many fans are they going to piss off going this route? And how many more are they going to disappoint when, after hearing so much about the 50th Anniversary Reunion Tour, folks buy tickets to THIS Beach Boys show, expecting to see Brian and Al and David ... only to find themselves cheated with the Mike and Bruce Show? Honestly, a maneuver like this shows NO respect for their fans, especially when all of the other members were ready, willing and able to "keep the summer alive" a while longer. And who would have EVER thought that Brian would be the one to want to keep it going?!?! (No word yet as to whether Brian, Al and David Marks will continue to work together ... but there has already been lots of talk about the follow-up album Brian wanted to do.) What a shame. 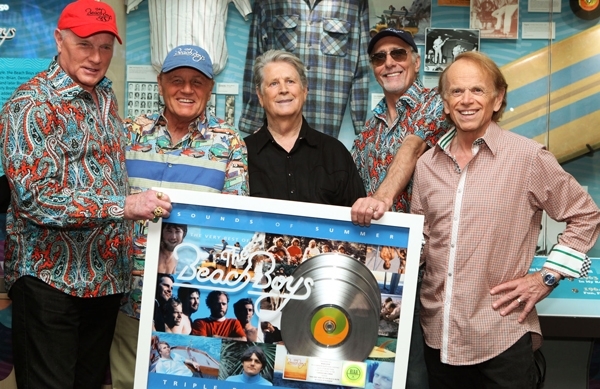 Meanwhile, The Beach Boys were awarded again this past week at The Grammy Museum, this time in acknowledgement of triple platinum sales of their 2003 "Sounds Of Summer" compilation CD and posed for what will most likely amount to a last round of pictures. Oh well, at least we'll get a new live album next year, recorded during the farewell tour ... and the two new hit compilations we told you about will be out in a few weeks (as well as another round of reissues of all of their old studio albums) ... and the new "Doin' It Again" DVD is a lot of fun to watch. I think I agree with you about the Chicago reunion. If they did it to show they were really friends, it would be cool, but they could still have Jason along, couldn't they? I always want my rock star heroes to get along and it's sad when they can't at least be amiable. If Danny Seraphine were there, too, then I'd feel more excited, but let's face it ... the real person I miss is Terry Kath, since he's the one that could really boost the power and energy of a Chicago show. I love them just as they are at this point, too. Not sure if Peter came back if that would push me to a show or not. Jason's great and he's fabulous to the fans. 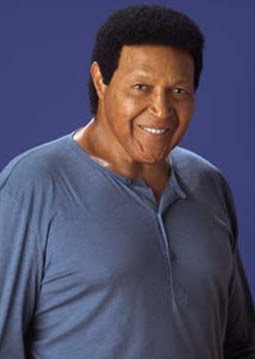 Here's a cool new video by Rubix Kube .. and check out how good Chubby Checker looks! Small and Humble ... and that is one hot MaMa to be. My youngest Daughter really likes her. I don't think I will miss Cee Lo ... I think Adam and Blake are all the reason I need to tune in. They are hysterical. Really enjoyed "The Walk" by Mayer Hawthorne! It's hard to believe it wasn't recorded in 1964 by Major Lance!!! Definitely my new favorite track ... and figured it was "old school" enough that the readers would enjoy it. Pretty positive response so far. (Again, this is kind of the concept of Al Kooper's "New Music For Old People" site ... showing that music very much in the vein of what we grew up loving is still out there. Ya know I always meant to mention that tune (The Walk) to you and the readers but would always forget. My Son, who just turned 20, showed it to me when it came out. He's 20 but has grown up with a big chunk of his Dad's favorites and loves 60's soul. Glad you finally got to hear it. His albums aren't bad either. Not as good as the music he's emulating maybe, but still good stuff. You might also check out Sharon Jones and the Dap Kings. Some of her tunes are also pretty good. Another Soul throwback. So glad to see your website back up and running! I wonder if your readers knew that Jim Peterik had a solo album out in 1976 called Don't Fight the Feeling. I always liked a catchy track called Hard Day at the World and have attached a copy. Now THIS is something I'm sure you don't hear every day! Be prepared to be bowled over by Randy Newman's incisive, unprecedented political satire ... check out his new video. Every thirty years or so, somehow, Randy Newman manages to have a mainstream hit, although, other than 1977's "Short People," I can't think of one. "Cold Turkey", "Three Amigos! ", "Toy Story" (1, 2, 3), "A Bug's Life", "Monsters, Inc.", "Parenthood"
"Meet The Parents", "Meet The Fockers" and "Pleasantville," to name a few. So, we shouldn't feel sorry for Randy -- he's doing just fine without a hit single! But, like all creative folks, I guess he just had to take another crack at radio -- and, the Internet -- hence, his latest satire, "I'm Dreaming." Liberal or Conservative, right or wrong, the song is his take on racism. With lines like "He won't be the brightest, perhaps, but he'll be the whitest," Randy just may have tipped his hat to the ultimate winner on Nov. 6. A few morning show teams may play it for laughs, likewise Imus and Stern may give it a few spins, but I don't think we'll hear it following a Taylor Swift, Katy Perry, Pit Bull, Bruno Mars, Jason Mraz or One Direction single! Not on today's pop radio -- not even in 2012. Read the brief interview before scrolling down to view the video. Notice that he's not worried about losing a Disney scoring gig, just that a young kid somewhere might not understand the satire. Maybe not his most subtle subversive best, but in this era, subtlety is clearly lost on the masses. A legal download supports a good cause, so forward liberally! The vault videos are doing super fine and I am playing lots of obscure titles. As a matter of fact today with my Windy City Wednesday feature I have on the GALAXIES from 1960 with a song called THIS ROCK AND ROLL, recorded for the Chess label in Chicago ... toss that one out to your people on the web site as that is truly an obscure rocker - but the cool thing is I was just contacted by one of the band members from the band after he saw my vid - - - LOVE THAT ! I think your readers will enjoy these! We have FINALLY posted Rich Appel's Top 100 One Hit Wonders Countdown from Labor Day Weekend! Thank you for your great review of my new books. I’m really happy that you like the additional research of America’s pop charts. We’ve gotten so many wonderful emails and phone calls from customers that, like yourself, enjoy comparing the research between Billboard and Record World. One customer stated that he thought he’d “never live to see a Record World compilation”. I hope to have the “101-150” book ready in early December. And, yes, we are going to publish a Cash Box “Hits” book that will include their “Looking Ahead” charts for the very first time. I can’t give you a publication date as of now. Again, thanks so much for all your nice comments – it’s very much appreciated!! Thanks for your efforts and info! This is cool ... sent into us by FH Reader Bill Hengels ... an original 1966 WLS Silver Dollar Survey SIGNED by Jim Peterik ... with The Ides Of March Hit "You Wouldn't Listen" sitting at #7 on the chart! What a great read this weekend, Kent! Learning about "the other" Ides of March was such fun. I was aware of Jim Peterik's connection with Chase, but didn't know it hadn't been covered in FH yet. Jerry Collins played trombone with Chase in '72 - '73, yet he lived here in Nashville. In fact, he lived next door to the young lady who became my wife. She was a high-school student who did some babysitting for Jerry and his wife, taking care of their daughter Marcie from time to time. We've searched high and low for Jerry and can't locate him anywhere. My gal would love to catch up with little Marcie, who would now be in her 40s. I have seen Jerry's name listed on numerous jazz LPs from the 60s, before he hooked up with Bill Chase. It seems that Jerry was playing other gigs here in Nashville - perhaps at Opryland - when he wasn't touring with Chase. Thanks for putting 'Run Back To Mama' on your post over the weekend. I have always liked that song. Listeners from our area remember a contest on Madison, Wisconsin, radio station WISM called 'Race For Chase'. The winning school got the group Chase to play at their high school. During that time they played 'Run Back To Mama' in heavy rotation on WISM. Chase played here in Richland Center shortly before the tragic plane crash. Founding member, keyboardist-singer Robert Lamm recently went out for coffee with Peter Cetera. But it just doesn’t look likely that there will be a reunion anytime soon: Cetera simply doesn’t want to commit to the band’s aggressive touring schedule. You recently asked how is one able to do a request show on Saturday night without the D.J. on duty not answering the phone. I learned this lesson a few years ago. I was in a station here in the city where a certain D.J. does a request show on Saturday evenings from 7 PM until 12 midnight. I was surprised ... he wasn't even in the control room. His whole show was on voice track (assuming you know about that) with voice tracked requests given out over the air so many times per hour. Probably the one difference between his show and the one you called up was that he had his phone lines blocked or all of them were on hold. Indicating to anyone who tried to call in that the lines were currently busy. Oh man it was so nice to hear that Kris Stevens is a nice guy since he was one of my heroes when I was a kid listening to WLS growing up in North Dakota. records made our local survey. I seem to remember songs like HE'S OLD ENOUGH TO KNOW BETTER and LONELY AVENUE for a couple. I've seen the Crickets once before in Lancaster, Pennsylvania, and they put on a really good show ... and they will be back in Lancaster next month for the Fall Doo Wop Spectacular at the American Music Theater and I look forward to seeing them again. I love Buddy Holly and the Crickets. I have all their original albums. I knew back then that they would be great. That leads me to Sonny Curtis, who wrote "I Fought The Law". Don't get ahead of me ... let me say it ... it's time to update the mystery of Bobby Fuller's death. Unfortunately I don't think there's any new information surrounding Bobby's death ... and I don't know that we'll ever really know the true circumstances surrounding his mysterious death ... which is why I still say this is the greatest rock and roll bio-pic never made. (Think JFK ... Hoffa ... and Fuller!) And do it right ... present it as a mystery ... with no clear-cut resolution at the end ... just show all of the different scenarios as we know them. I'll betcha it would put Bobby's music back on the charts again and, if done right, would fill the theaters due to great word of mouth! The Crickets are a part of Rock And Roll History and should not be missed. Sadly they were unable to attend their induction ceremony into The Rock And Roll Hall Of Fame due to the illness of Joe B. Mauldin so this chance to see them perform here live (and locally) is a real treat. Put me down for two tickets! >>>The Crickets' vocalists will bring the actual hits they sang with Buddy Holly to St. Charles in the intimate setting of the Arcada Theatre. As the Crickets played instruments but did not sing on any of the records they cut with Holly, one wonders what vocalists are being referred to. In most cases, backing vocals on records featuring Buddy were dubbed in later by one of several sets of singers who generally went uncredited: The Picks, The Roses, The Tollets, etc. Even The Hollies backed their namesake through the magic of latter-day overdubbing in 1980. Thirty two years after John Lennon’s sailing trip to Bermuda sparked the creative renaissance that inspired the final album released in his lifetime; the island celebrates the late legend’s enduring spirit and vision with the "John Lennon Double Fantasy Bermuda Tribute," an all-star charity concert named for that landmark recording. The show, which takes place at the Bermuda Botanical Gardens on Friday, September 21 at 8 p.m., will feature a wide array of performers, including Heather Nova, Maxi Priest, Biggie Irie, Judie Tzuke, Roy Young, Chewstick, Rachel Brown, Joy Barnum, Paul Muggleton, Bailey & Tallula Tzuke, Robert "Sai" Emery, Christina Frith, Jonathan Frith, Bailey Outerbridge, Steve Easton, Michael Cacy and others. Net proceeds from the concert will benefit Bermuda Charities. Since 1982, the world has celebrated September 21 as the "International Day of Peace." The event also marks the release of several commemorative multi-media items, including the star-studded Lennon Bermuda CD and launch of a Lennon Bermuda book. The double CD includes 32 Lennon and Lennon-McCartney classics by many of the artists participating in the concert, in addition to Paul Carrack and Lennon’s widow Yoko Ono. The project, which retails for $20.00 and will also be available on the Lennon Bermuda website (www.doublefantasybermuda.com), includes a bonus video of "All You Need Is Love." Visitors to the John Lennon Double Fantasy Bermuda Tribute are also invited to view the new Lennon sculpture (also called "Double Fantasy") outside the Masterworks Museum of Bermuda in the Bermuda Botanical Gardens. It was created by Bermudian artist Graham Foster, who is best known for his huge mural "The Hall of History" inside the Commissioner's House at the Bermuda National Museum in Dockyard. The two-story, 1000 square foot interior mural depicts five centuries of Bermudian history and took approximately 7000 hours (over 3 years) to complete. On November 25th 2009, Her Majesty The Queen, officially opened the Hall of History mural and on this occasion was presented with a painting by the artist. The sculpture was unveiled in May as part of the museum’s "Imagine The Art of John Lennon" art exhibit. Foster’s iconic image of Lennon also appears on the Double Fantasy Bermuda T-shirt, available for $20 at the event and in the shop section of the website. On August 22, PRS For Music, the collecting society representing 90,000 songwriters, composers and music composers, became an official sponsor of the Bermuda tribute concert. PRS for Music has been present in Bermuda for a number of years promoting the value of copyright and raising awareness about the importance of music licensing which ensures that creators of musical works can earn a living. A team from PRS for Music are working with government departments, business leaders, music users, broadcasters and key stakeholders to discuss copyright issues, listen to concerns and understand what work needs to be done to improve the awareness of the requirement for music licenses in Bermuda and to highlight the continued importance of the Bermudan music industry. Karen Buse, Director of International from PRS for Music, says, "We are delighted to be supporting such a fantastic event and tribute to one of the greatest musicians and British songwriters the world has ever known and enjoyed. We felt this was a great opportunity to be involved in something special which brings local and international music talent together and puts live music in Bermuda on the world map." The Lennon-Bermuda story is a remarkable chapter in the singer’s final year. In June 1980, Lennon left Newport and became a passenger on the Megan Jayne for a five day sailing voyage to Bermuda that would change his life. Prior to his adventure to Bermuda, fans the world over had begun to worry about Lennon, as his drive for writing and creativity lacked vigor. The pressure to produce quality music, the pressure of his family and troubles got the best of him and his creative energy for songwriting suffered. Eventually the pressure and the reclusive lifestyle led to a self-imposed hiatus — a period he chronicled on Double Fantasy songs like "Watching the Wheels." During this time, Lennon started to further explore his lifelong fascination with sailing. Lennon immersed himself in the culture of sailing, learning the ropes and even acquiring a small boat for himself. After consulting with Takashi Yoshikawa, then the leading authority on Ki, Lennon was told to sail to the southeast to overcome the negative shadows casting over him. After agonizing days at sea with twenty-foot thrashing waves, forceful winds and ultimately facing the threat of life or death, Lennon arrived in Bermuda a different man from the one who left Newport. 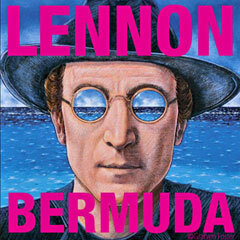 From seasickness to being the captain at one point and the uncertainty of life, Lennon later cited the journey to Bermuda as a life altering and inspirational experience that was a major part of the catalyst for the end of his five year song writing block. Arriving to Bermuda felt like an accomplishment, and spotting land was like seeing the gates finally open before him and leaving the journey behind them. The combination of the prospect of death with the sun and the sand inspired new music and lyrics that marked the revival of Lennon’s creative spirit. Lennon spent the following weeks with passion and enthusiasm as he wrote his final songs. Double Fantasy, his first recording in five years, was named after a flower he observed in Bermuda. He returned home not only with new songs but with a new vision and enthusiasm for life itself. John Lennon’s legacy has been honored numerous times by musicians throughout the world, but the Double Fantasy Bermuda Tribute — the concert, statue, book and CD — is the first official celebration of his intimate connection to the famous island. Man, I'm craving one of those amazing Chicago dipped italian beef sandwiches right now! OK, on the news front - as you know, I interviewed the fascinating Andrew Loog Oldham a few issues ago in The Beat. I know you and most of your readers know who he is and are familiar with his story. He now lives in Colombia (South America) and British Columbia (Canada) and has a son living in Brooklyn; I have a daughter living in Washington Heights. Early in October we're going to meet for lunch in the city. Am I excited? You can believe it! I'll tell you and your readers all about it after it occurs. Regarding who first played a Beatles record in North America, in mid to late December of 1962, on a Saturday evening Toronto Ontario radio station CFRB 010AM, on the program "Calling All Britons", played Love Me Do. One possible explanation on how they got the single is George Harrison's uncle Edmund French emigrated to Toronto. He may have been sent a copy of the UK single from Liverpool and he sent it to CFRB radio station.